performed by Christoph Soldan and the Silesian Chamber Soloists. HD Recording · DDD · Duration: 19 Min. 48 Sec. he concertos are just the medium between being too heavy and too light - they are very brilliant - pleasant to hear - certainly without falling into the void - here and there it is possible for the connoisseur alone to get satisfaction - but such - that the laymen can be contented without knowing why. 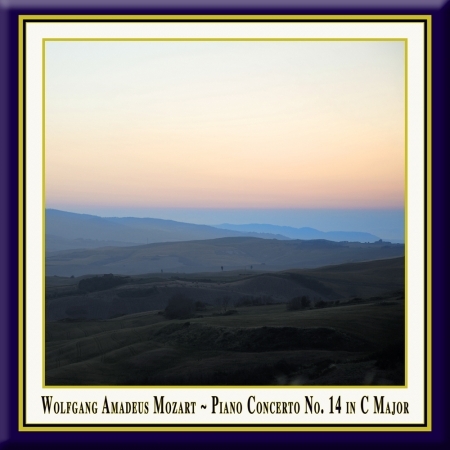 aving provided us with magnificent examples of concertos for stringed and wind instruments, Mozart reaches the ideal conception of a concerto with his piano concertos. They are the high point and peak of his instrumental producing. In Mozart's piano concertos two equal forces are facing each other that are really able to compete. They are therefore essentially his very unique creation. The piano concertos K. 413 - 415 and K. 449 were the first in a row of 17 momentous concertos created in Vienna and consequently founding his fame as virtuoso to the Viennese audience. The double possibility given to the performance, of either playing full orchestra, with oboe and horn (in the C-Major also with timpani and trumpet) or just with string quartet shows the flexibility he wanted to produce. The concerto in C-major K. 415 is the most splendid one. The second movement Mozart first planned in c-minor, but he gave up this intention in favor of a light, jaunty movement in F-major. Nevertheless, there is a slight reminiscence to this original minor movement in the concerto's last movement: the vivid six-quaver beat with his appeal to the Papageno-motif is interrupted two times by a melancholic insertion in c-minor. The concerto in E-flat-major K. 449 is the first composition registered by Mozart in his own catalogue of works that he started in February 1784. It belongs to the most accomplished works of Mozart's music, with his latent, but dramatic dynamic and its depth that goes beyond the diverging antagonism of musical forces. The piano concertos of Mozart never seem to touch the border of the socially appropriate - how could it, being designed to be acclaimed. But even so, it opens the doors to tell about the dark and the bright, the serious and the cheerful, the deepest - to lead its audience to a higher level of knowledge. The audience that is to deal with Mozart's piano concertos is the best there is. he pianist Christoph Soldan (born 1964) studied under the Professors Eliza Hansen and Christoph Eschenbach at the Hamburg Musikhochschule. His break-through to active international concert playing came in a tour with Leonard Bernstein in summer 1989. Of Christoph Soldan, the world-famous director said, "I am impressed by the soulful size of this young musician." Since then, Soldan has played in numerous tours with renowned orchestras across Europe and abroad. In particular, this can be seen in the CD recordings of all of Mozart's piano concertos, which were performed and recorded from 1996 until 2006. A tour of piano evenings took place in Mexico and other countries in Central America in October 1997. In August 1998 he debuted in Salzburg and in the Chamber Music Hall of the Berlin Philharmonic, and in May 1999 in the Leipzig Gewandhaus. In March 2000, there were three piano evenings in Japan. So far, there have been radio and television productions with the Hessische Rundfunk, Deutschlandfunk, SWR, ORF and ZDF. The Bayerische Rundfunk broadcasted his piano evening in the Munich Residenz in October 1998 and his concert in the Bad Brückenau music festival live in 1999. Radio Bremen braodcasted his recital in Bremen in august 2002. Starting in 1996 Soldan was performing all 27 piano concertos by Mozart together with the slovakian chamber orchestra Cappella Istropolitana, the South-West German Chamber Orchestra of Pforzheim and the Silesian Chamber Orchestra Katowice. This cycle of concerts ended in January 2006, performing the concertos for 2 and 3 pianos. Christoph Soldan developed a "pas de deux for piano and Dance", together with his wife, the dancer and choreographer Stefanie Goes. The première took place in Stuttgart in May 2000. In Spring 2001 he participated the Prague Spring Festival accompanied by the slovakian chamber orchestra "Cappella Istropolitana". Two recitals in Hamburg and Berlin were followed by a live-recording of two Mozart piano concertos in the medieval monastery of Maulbronn in september 2002. In January 2004 the première of the new dance project "something about humans and angels" took place in Stuttgart followed by a concert-tour to South Africa. Since 2007 Soldan is working also as a conductor concerning the performances of piano concertos by Bach and Mozart. In the 2015/2016 season, Christoph Soldan will be guesting in Germany, Italy, Spain, Austria, Slovakia and the United States with various programmes such as recitals, literary concerts, childrens concerts, as soloist with 5 of Mozart's piano-concertos as well as in chamber music programmes with Brahm's piano quintet op. 34. Since 1994 Christoph Soldan was artistic director of the "Schubertiade auf Schloß Eyb". In 2007, together with his wife, Soldan founded a theatre in the north of Baden-Württemberg between Stuttgart and Heidelberg, where all artistic programmes are taking place since then. The German press describes Christoph Soldan as an artist personality who works with the spiritual intensity and soulful dimension of a piece of music, rather than giving a purely technical virtuoso performance. This challenge to music and to himself is rarely seen today. he Silesian Chamber Soloists are the section leaders oft he Silesian Philharmonic Orchestra in Katowice (Śląska Orkiestra Kameralna). All of them are outstanding soloists, who studied on several Music-Universities in Poland and Germany. In 1993 the ensemble has been founded as a quartett first and was enlarged later by an additional doublebass position. The high level of artistic performance made the quintet to the leading chamber ensemble in Silesia. Concert tours have been organized to various festivals within Poland and other European countries. The Silesian Chamber Soloists performed with great success in the Schleswig-Holstein Musik Festival, MDR Musiksommer und im Rheingau Musik Festival. Cooperations were made with outstanding conductors and soloists, such as Krzysztof Penderecki, Yehudi Menuhin, Valery Gergiev, Christoph Eschenbach, Justus Frantz, Pinchas Zuckerman, Maxim Vengerov, Mscislav Rostropovich and Christoph Soldan. One special feature does result from the fact, that the concertmaster of the ensemble, Dariusz Zboch, is not only a very gifted violinist but at the same time arranging pieces of music. His last work has been published on two CD productions, a cycle of arrangements of the solid goal hits from the 60th and 70th concerning the songs of Procol Harum, Queen, Pink Floyd, Elvis Presley, The Beatles, Abba oder Deep Purple. This true "cross-over-project" is combining popular music with works of the classical repertoire. In 2015 und 2016 there are 5 concert tours, that take place together with the german conductor and pianist Christoph Soldan throughout several european contries. As repertoire there will be performed 4 piano concertos by Mozart, Schubert´s trout-quintett, Brahm´s piano-quintett opus 34 und Chopin´s piano-concerto in e-minor.